As the Kenya sun scorches the red earth, elephants trumpet their delight while sliding into the cool mudbaths. Enraged buffalo chase a lion, giraffes chomp on leaves and tender shoots of thorny acacia foliage, a pink blanket of leggy flamingos line the shore and traditional tribes adorned with colourful beads herd their goats. During our time in the Masai Mara we get close to a bachelor group of lions. We put our dream to reality and travel to Kenya to visit orphan elephants, Ngasha and Kandecha who we sponsor through the David Sheldrick Wildlife Trust. 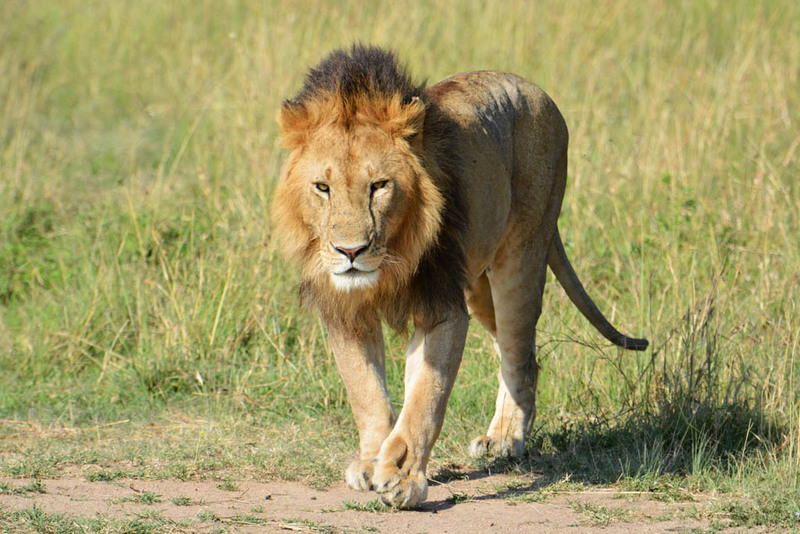 After researching, planning and email communication with tour companies and guides we settle with Martin Maina from Nairobi Specialist and create a perfect itinerary for Kenya that includes Ithumba, Masai Mara, Lake Nakuru and Lake Bogoria. Our first day in Nairobi, we visit Ngasha and other elephant babies during their 11 am milk bottles and play time at the Nairobi Elephant Orphanage. In the afternoon, we return for a special afternoon visit when the orphans are put to bed. Going behind the scenes with the baby elephants and their keepers, who devote their lives to the orphans is a once in a lifetime experience. 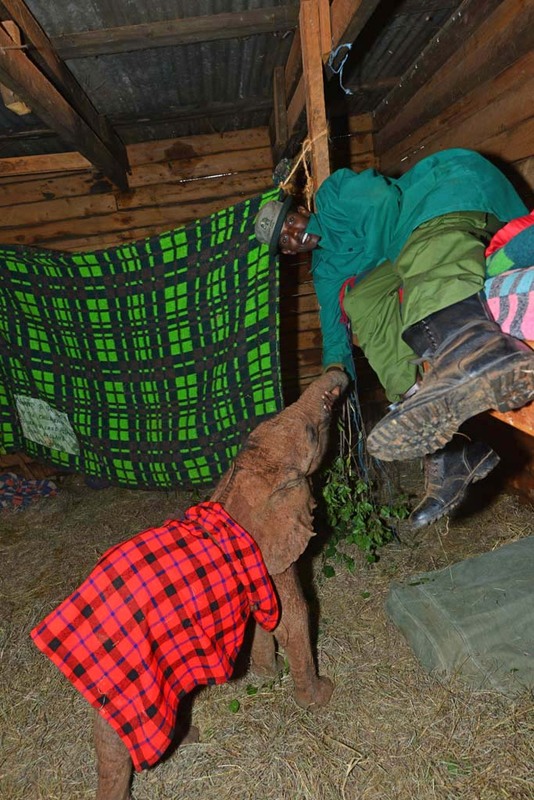 Keeper Adan Kombe and orphan Mbegu get ready for bed. The keepers spend 24 hours a day with the baby elephants. The next day we make the long dusty drive to Ithumba in Tsavo National Park. Kandecha our other sponsored elephant has been transferred here from the Nairobi Orphanage. He and the older babies will continue the next phase of their rehabilitation and eventual release. Ithumba is booked exclusively to one group at a time, so we have the camp and elephants to ourselves for the next couple of days. 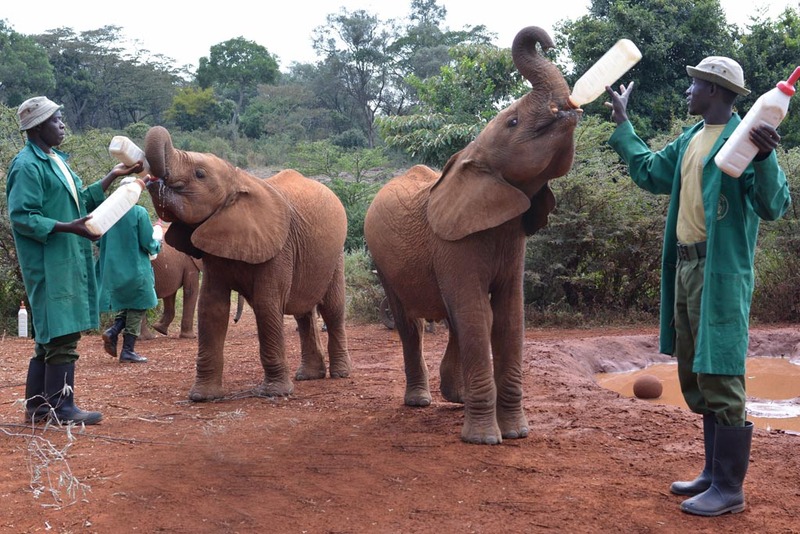 The mornings and afternoons we spend with the baby elephants during their milk bottle feed and their mud bath. 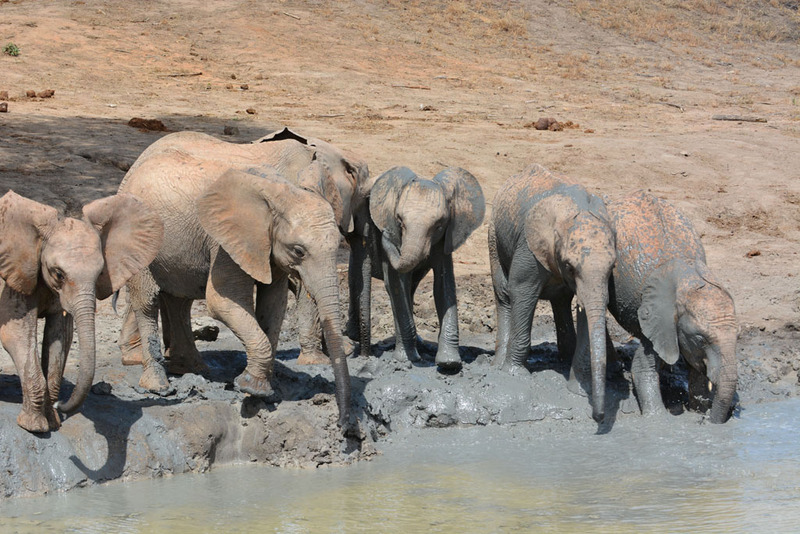 The wild elephants of Tsavo arrive so they can bath and interact with the orphans, which is a sight to behold. We drive back to Nairobi and spend the night before heading to the Masai Mara. We have a relaxing night at the Wildebeest Eco Camp while Martin makes sure everything is in place for our camping trip to the Masai Mara. He picks us up early the next morning with the landcruiser packed with camping gear, food, beers and Sammy our cook, who accompanies us to the Masai Mara and Lake Nakuru National Park. The elephants come close to the vehicles in the Masai Mara. 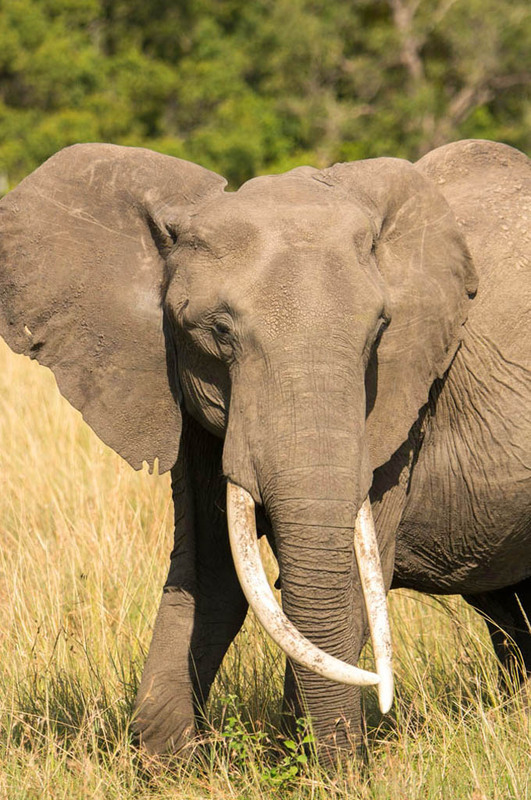 We spend four days at a campsite in the Masai Mara directly above a Hippo pool and go on safari drives spotting everything from lions on the savannah plains, giraffes, and elephants at sunrise. It’s the beginning of the Great Migration and wildebeest and zebras regularly visit the river bank. We sit around the campfire at night, listening to hippos splashing and wallowing below and lions roaring close by. 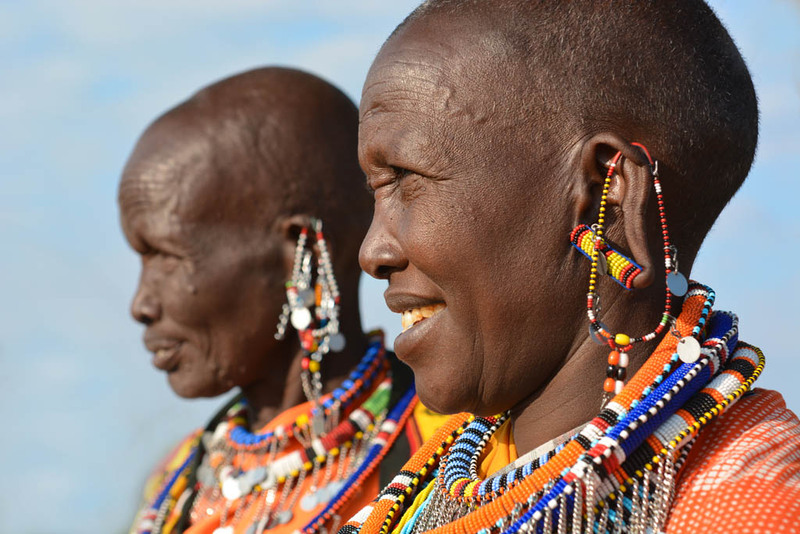 The Masai Mara people are a big part of Kenya. From the Masai Mara, we travel to Lake Nakuru National Park and stay in Naishi Guest House. This is our base for the next three days while exploring Lake Nakuru. After camping for four days, the wood-fire heated shower is pure bliss. The bedrooms are gorgeous with their own shower and toilet and the huge timber kitchen is a dream for Sammy our cook. Lake Nakuru is a small park but has so much to offer. It is one of our favourite places in Kenya and different to the Masai Mara so the two parks can’t be compared. 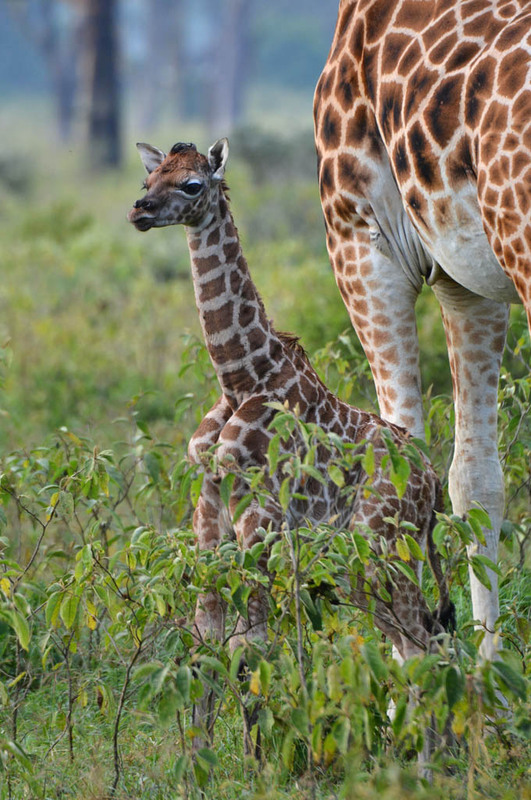 The rare Rothschild Giraffe is one of the highlights here for us. Other great spottings are the five rhinos that came close to our vehicle, jackal pups and two leopard sightings. 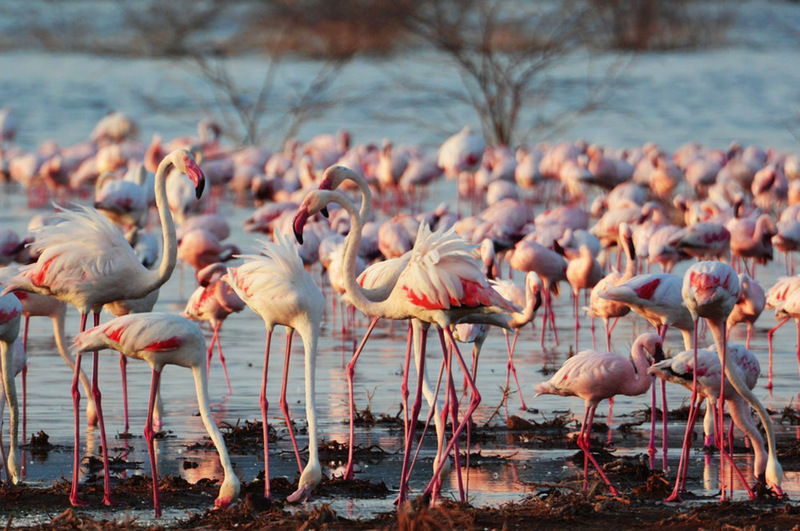 The flamingos are not accessible during our stay at Lake Nakuru, but Martin confirms they are at Lake Bogoria. Due to climate change and fragmentation, flamingo’s numbers are nowhere close to what they were in the past. Although fewer in numbers, the sight of these long-legged pink birds on the shoreline is no less hypnotizing. We camp overnight at Lake Bogoria right beside the lake to visit the flamingos in the morning and the Pokot Tribes at Lake Baringo in the afternoon. The Pink Flamingos on the shoreline are an incredible sight. The Pokot tribes are cultivators and pastoralists who have kept their traditional ways, so it is an authentic cultural experience. The road from Lake Baringo to Lake Bogoria is very dusty and rough therefore we recommend this only if you are very enthusiastic to visit the tribes! Kenya is recognised as one of the best places in the world to go on safari. 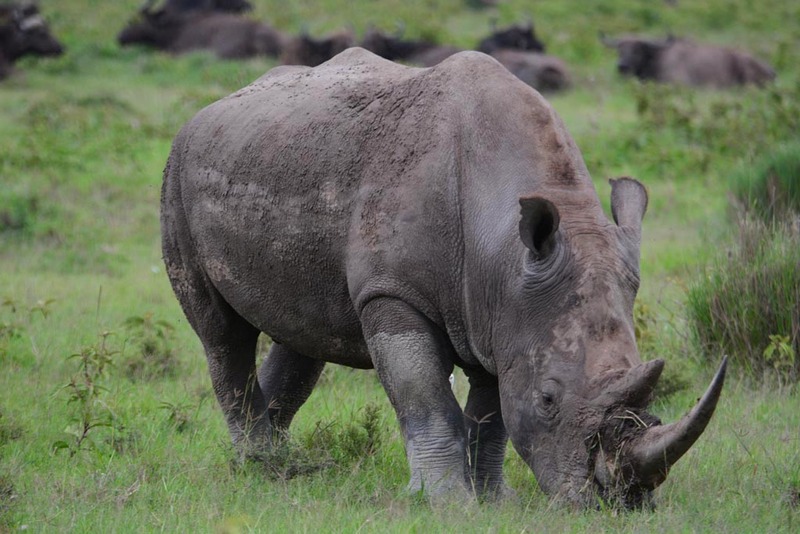 Their long-standing policy of no hunting, together with their commitment to conservation and preserving wildlife against many obstacles, has countries following in their footsteps. We can’t praise Martin our guide enough. Right from the start, he was honest and enthusiastic about our camping safari. He is open to any ideas and let us know what would and wouldn’t work. During our trip, we made a few changes which could have been a nightmare, but Martin always takes it in his stride and remains flexible. His price is excellent because he’s not out to make a huge profit, only a wage. He is very knowledgeable about the wildlife and his country and for this reason, we recommend Martin for any trip type and duration. Sammy cooks the most delicious meals with a few pots and pans and he can also whip up any dietary requirements or special requests on a gas burner or over hot coals. Martin and Sammy are the most genuine people we know, love their jobs and make a great team. Go Martin and Sammy! 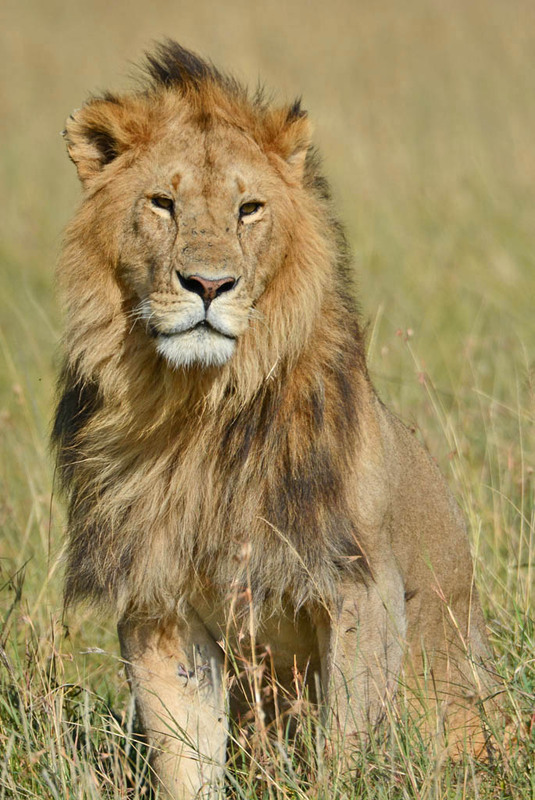 We see lions every day in the Masai Mara. Wow Ray & Sue. Have really enjoyed your blogs on Kenya. We have been trying to decide on South Africa or Kenya & think you have sold us on Kenya. 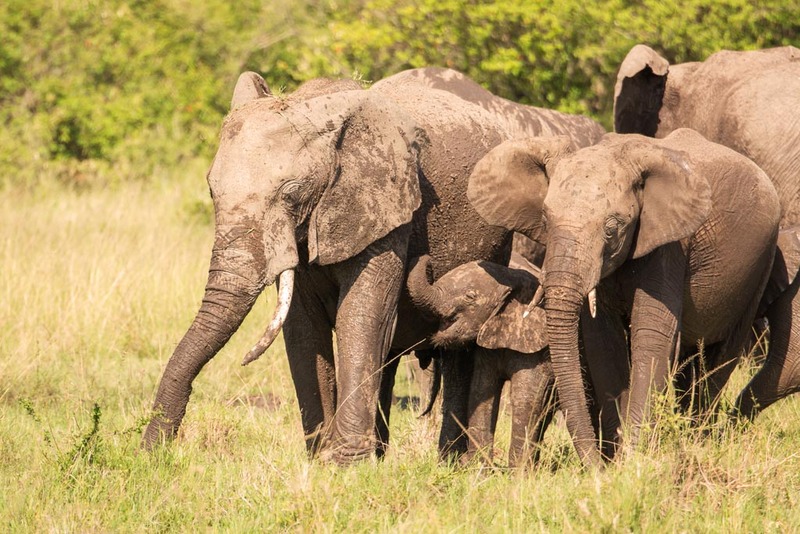 Have you been to Kruger? The only thing stopping us with Kenya is the security. With images like these we are definitely sold though. Thanks for your comments John. We are glad we don’t have to make the choice! We were in Kruger years ago & it is an amazing destination too. We love Kenya, everything about it, the wildlife, the people and the food. This isn’t going to help you make your decision, but our opinion is Kenya is just as safe as South Africa. My sister and I recently spent a month in Nairobi, Maasai Mara and a beach house down near Mombasa. I never felt unsafe for one second. As with anywhere, be sensible. The real danger is along the northern border with Somalia, and the areas you would be going to are far south of that. Awesome work guys. Love your work. You seem to have so much passion for travel and wildlife. Everything is so detailed your photos and writing. Keep it up! Thanks for your awesome comment Renee. We certainly have a passion for it and will be continuing! Beautiful photos Ray and Sue. You are a great couple and both so talented. I feel I have experienced the trip with you. Thanks Laila. We hope we have inspired you enough to convince you to go camping in the Masai Mara! 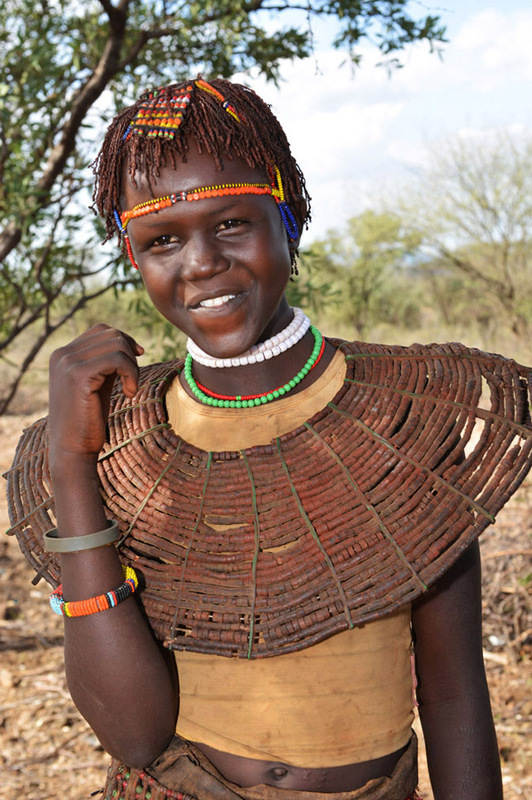 Your photos amaze me every time, they are so well captured …..the Pokot tribe women are beautiful to. Do you take pics of the food there ? Thanks for your comment and compliments Leigh. The Pokot tribe was one of the highlights of the trip. The ladies are beautiful. It is a very rough and dusty drive to reach them but well worth it! As for the food, we were too caught up in the day’s excitement to be thinking about too many photos, unfortunately. Thanks for mentioning that though as we will be sure to keep that in mind for our next blogs. We can assure you the meals were scrumptious. We are both vegetarians (which isn’t a common diet in Kenya) and the food Sammy cooked was some of the best we ever had. At night we usually had soup, a main meal and fruit for dessert. Lunch was similar and breakfast was eggs cooked however we wanted, toast, pancakes and fruit. You can buy the ingredients yourself and let Sammy know what you want him to cook or you can leave it all in his hands. If you have any more questions just ask us! 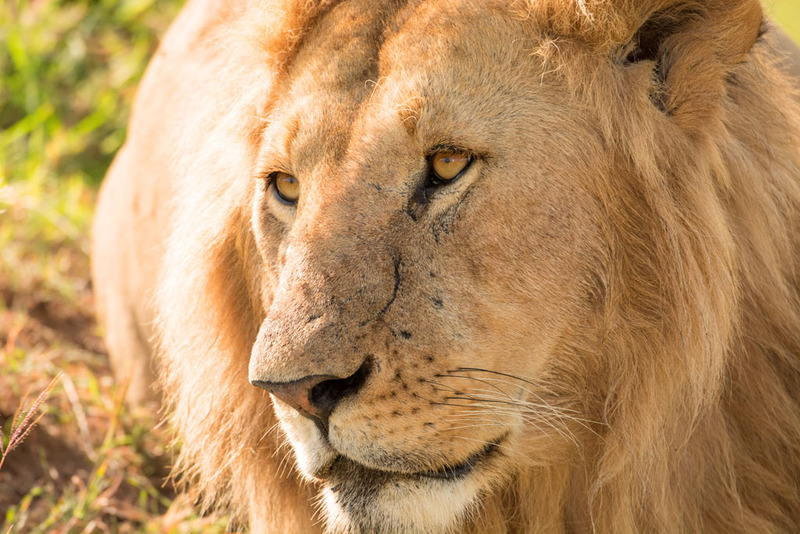 Thank you Ray and Sue — What an amazing journey to Kenya with your photos. They are so beautiful and put a smile on my face recalling my own adventures in Kenya. The people in Kenya are extremely warm and gracious and a pleasure to talk to. The country is beautiful and there is so much to offer there. If I were to get a work permit, I would move there in a second. I felt like I had come home. A lot of that feeling came with my (and Ray and Sue’s) driver, Martin Maina. What an absolute gentleman — honest, thoughtful, experienced and a true joy to have spent my time in Kenya with. His wife, Anne, and his daughter Michelle are just as wonderful. Martin’s prices were incredibly reasonable. He spent a lot of time helping us organize our trip to ensure we made the best use of our time. But still remaining flexible for our last minute changes! An amazing guide in spotting animals and manoeuvering you into the best locations for amazing photos. He’s knowledgeable about the country, people and animals and can answer any questions you might have. I can’t rave enough about Martin. Thank you Ray and Sue! What amazing work you do and your photography puts you right in the action. I hope to meet you one day! Hi Julie. Thank you for all your comments, we have really enjoyed them. We agree with everything you have said. Kenya is one of the most beautiful destinations in the world. We owe the success of our trip to Martin. He not only organised everything but he also gave options on less expensive alternatives. Whatever your budget he will come up with the ideal itinerary in the most cost effective way. He definately is an amazing guide and works hard to ensure his clients needs are met. It would be lovely to meet you Julie, hopefully on our travels one day! Wow what an amazing place, stunning photo’s and I really love the part about the orphanage, what beautiful people. Elephants are truly a wonder and I could only hope to see them in the wild myself one day. Good job Sue and Ray. Thanks for your comments Natasha. Special! It is filled with the excitement of anticipation you two had setting off for such a long awaited trip. You remind me of parents off to visit their kids in boarding school! That you love those baby elephants is very obvious. What a trip! And you deliver it to us with such intuitive RIGHTNESS! We catch the atmosphere as well as the panoramic beauty of it all. Right down to the intimate details of dusty roads and the sumptuous luxury of a hot bath after roughing it. Your scrupulous inclusion of a rough road in no way detracts from excitement of travelling it and I bet you laughed as you bounced over the bumps! There is no downside in travelling with you guys. And as much as you gave accolades to your guides and helpers, I imagine your appreciation of their land and their efforts was a bonus they richly deserved. So well done. I would recommend your blogs to anyone who wants to travel and especially those who can’t. It’s the next best thing! Hi Gypsy. We are glad we have inspired you to perhaps visit Kenya! It is an incredible country, the people, the wildlife and the food, everything about it is amazing.Thank you for reading and recommending our blogs! Hi Doll. Sorry, no we are not related to John and Nann Sinclair. We are from Australia. Thanks for visiting our website. Wow love these too fantastic.